Well we call it Sydney Airport but really it's just one of many in the Sydney region. It's not the largest either but it is the "international" one, of course. And the one we first think of, unless you think of Bankstown or Richmond or Camden or whatever first. It isn't - or wasn't - the Sydney international airport at Rose Bay, of course! That one was at Rose Bay on Sydney Harbour. No, we are looking a a land-based "airfield". Like Rose Bay it's historically important - not because it was Sydney's first aviation location or even "landing ground" but because it's relatively old and significant on several different levels. It has layers of history, with indigenous use, environmental importance, recreational use and major engineering works to commend it to our attention. We've even moved a river just to accommodate it. In short, Sydney "Kingsford-Smith" Airport at Mascot is one of the oldest continually operating airports in the world. In 1919, Nigel Love's Australian Aircraft and Engineering Company leased land from the Kensington Racing Club (adjacent to Ascot racecourse) and established an aerodrome. It was, basically, a swampy paddock. A flat, swampy paddock. 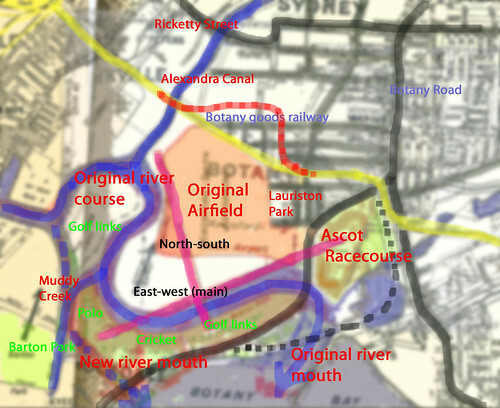 With Cooks River to the west, some recreational grounds and Botany Bay to the south and Eastlakes swamp to the east. As an aside, it was H. E. Broadsmith and Nigel Love who in 1919 established Australia's aircraft manufacturing industry, forming the Australian Aircraft and Engineering Company (AAEC) to produce 6 AVRO 504K training biplanes for the R.A.A.F. and 7 for other customers. Broadsmith determined that Mountain Ash was the best local timber for manufacture to British Aeronautical specifications. A canvas hangar was built and the first aircraft was assembled on site; the first flight taking place in November 1919 with the aforementioned Nigel Love in command. By the mid-1920s, regular air services between Sydney, Melbourne and Adelaide were underway and the Australian Federal Government had taken control of the airport. In the 1940s a passenger terminal was opened and the Cooks River diverted to allow for the construction of two new runways, including 07/25 as the "main" runway aligned east to west. Both the suburb of "Lauriston Park" and the Ascot Racecourse, immediately to the east, were subsumed into the growing aerodrome. 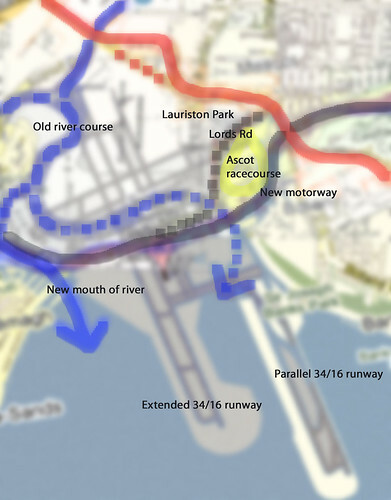 As shown in the map above, the main road south originally split the racecourse and the aerodrome, with a tramline and a balloon loop to the north of the racecourse itself. 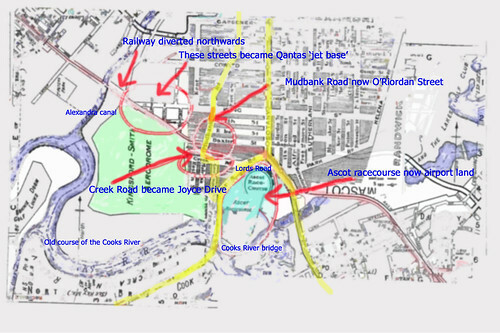 As the airport grew the road south - and its bridge over the Cooks River - was diverted to the east. The Cooks River itself being diverted to the west. During WWII Sydney hosted No 4 EFTS at Mascot, part of the Elementary Flying Training Schools (EFTS) scheme, later to be re-dedicated to Communications. In 1963 work commenced on the construction of the 34/16 runway extension southwards into Botany Bay, in preparation for larger, heavier international aircraft carrying greater fuel loads (and needing a longer runway). In 1965 work commenced on the construction of the "new" International Terminal, again in readiness for newer, larger aircraft (not that they actually expected the Boeing 747 to be quite that big.). In 1989 a fairly close-spaced and slightly staggered parallel runway 34/16 was approved, being completed in 1994 (making 3 operational runways). After all of that investment the Australian Government then privatised - for better or for worse - Sydney Airport in 2002. Not to be confused with Western Sydney Airport, not built but "planned". 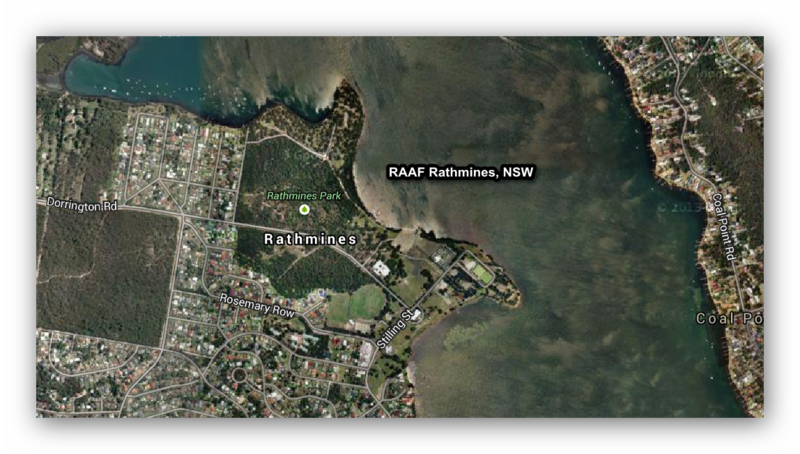 RAAF Rathmines on Lake Macquarie, south and west of Newcastle and north of Sydney and the Central Coast. A WWII "air base" with a difference! The traditional inhabitants of this land were known as the Awabakal people. 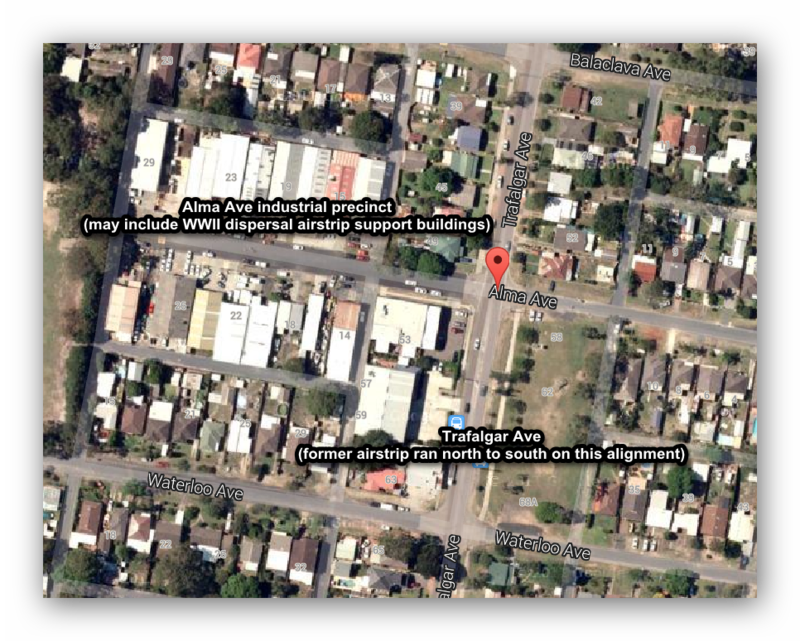 Awaba is the Aboriginal name for the region and Ninkinbah was the Aboriginal name for Lake Macquarie. There are several sites within Rathmines Park that demonstrate Aboriginal use of the area. Early European settlement around Rathmines took place in the 1840's with the name of Rathmines derived from the Hely family (extensive landholders on the Central Coast) that came from a town named Rathmines, located near Dublin in Ireland. The Hely family built a homestead and farmed a significant portion of the land that now makes up Rathmines Park. However the story of Rathmines as an air base starts when the site on the shores of Lake Macquarie was identified as a possible place for a flying boat base in 1936, after the Director of Duties, RAAF HQ Victoria Barracks, Melbourne gave instructions to investigate and recommend a site for a flying boat base in the Newcastle region. A ground and water survey of the bay and inlet was undertaken, and while the Rathmines site was the second recommendation, it was considered as the most likely site, and was chosen. During July 1938, No 5 Squadron from RAAF Base Richmond was sent to investigate landing areas and sites around the Lake Macquarie area for the establishment of the Rathmines Base and the eventual move of the squadron. On January 1 1939, the No 5 squadron was renamed No 9 (Fleet Cooperation) Squadron. Further surveys of the area were made in August 1939, and in September camp was set up, with arrangements made to rent local cottages as living quarters. The Base became operational when the No 9 Squadron transferred from RAAF Base Point Cook to the selected 31 hectare site. 9 Squadron was initially equipped with Supermarine Seagull flying boats. PBY-5 Catalina flying boats were next to arrive in February 1941, and by September 1943 the base comprised 14 Catalinas, two Seagulls, a Dornier Do24 and a Douglas Dolphin. Rathmines also housed Walrus, Martin Mariner, Kingfisher and Short Sunderland and Empire flying boats. With 230 buildings and other marine facilities there were 40 aircraft and almost 3,000 RAAF personnel at the base c.1944-45. As well as being a repair, servicing and new aircraft conversion centre, it was also a base for air crew training. A total of 168 Catalinas were flown with the RAAF, the Catalina flying boats being the only aircraft to see continuous service with the RAAF during wartime operations against Japan. Nevertheless, and somewhat sadly, in January 1952 the Catalina was declared surplus to requirements and the aircraft taken out of service. Post-WWII Rathmines continued as a ground training base with an Officers' Training School and training facilities for senior NCOs, PT instructors and national servicemen. The operational focus shifted to "search and recovery" operations. An airstrip was also roughly built on the promontory for the sole use of the C.O. 's Auster aircaft. 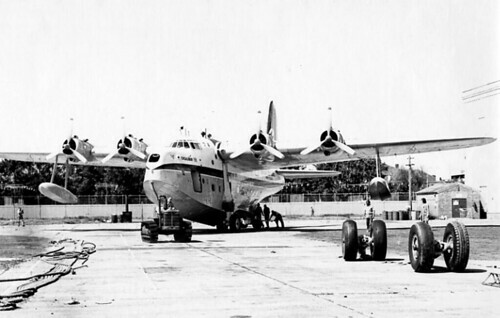 Seaplane operations were progressively disbanded during the 1950s. 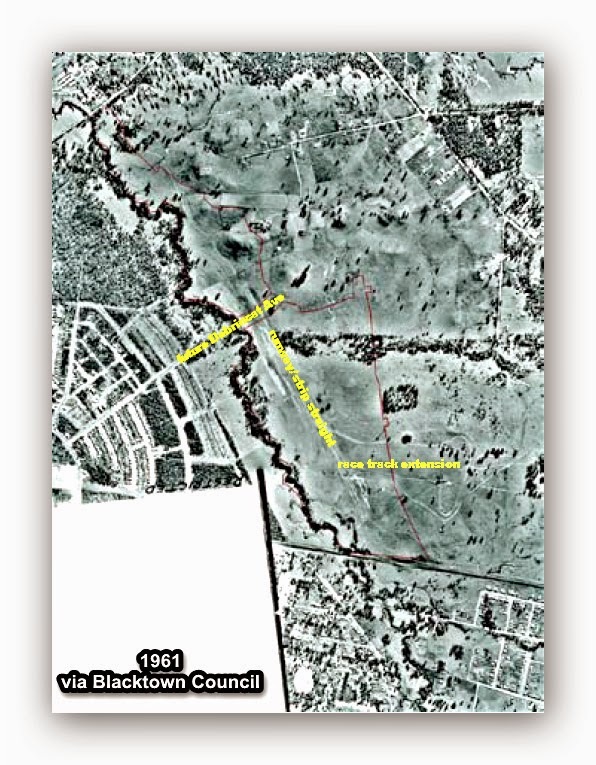 Circa 1962 the site was sold to Lake Macquarie Council, following which many smaller buildings were purchased and removed from the base or re-purposed by the Council as, for example, local community halls. Of 230 buildings just 10 remained intact in 1998. A large seaplane/flying boat servicing hangar was also disassembled and shipped to RAAF Base Richmond to house the RAAF's initial fleet of Lockheed C-130 Hercules aircraft. The Rathmines base has since been heritage listed by the NSW State Government. See also the Woy Woy/Ettalong airstrip and nearby Tuggerah airstrip (where Catalinas were reputed to do "touch and goes"). Want even more? Here is an updated list of Sydney's airports. Woy Woy Aerodrome was constructed in 1942 as a 'dispersal' airstrip for the Fleet Air Arm of the Royal Navy. The airfield was built as a satellite of Schofields. 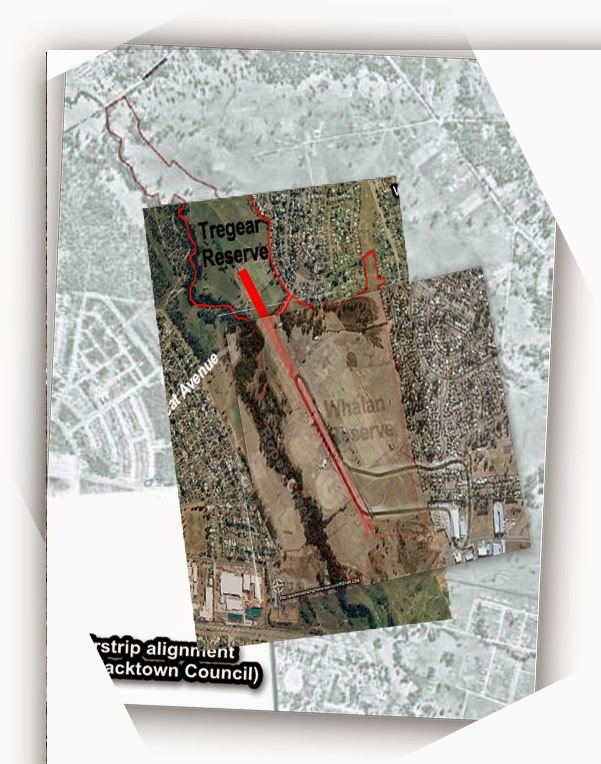 The airstrip ran north to south next to what is now Trafalgar Avenue, Woy Woy. It was constructed from compacted red gravel. The red gravel may still be seen (if you look hard enough) along the edge of the road surface in some places. As Trafalgar Avenue has a slight bend at the northern end it's unclear to me exactly what the alignment was, however it was of a substantial length roughly parallel with current day Trafalgar Ave. The hangars and service area were located in what is now Alma Avenue. Some hangars or support may still be in existence, perhaps much modified, used as warehouses or other industrial buildings. I have looked at these building but without looking inside and out the back it's hard to be certain of their vintage. The airfield was last used in 1946 and officially closed by 1950; the land subsequently developed for residences. A last-ditch stand was made to preserve both this strip and Tuggerah to the north as emergency landing fields between Sydney and Brisbane but as the reliability of commercial aircraft improved the need for such airfields declined. An anti-aircraft battery protected the airfield, located in Blackwall Mountain Reserve to the north and east of the strip. From time to time artifacts, including aero engines and drop tanks have been found discarded and buried alongside the strip. More details may be found on Steve's All things Woy blog and a reworded version with slight differences here and a crash landing in 1950. Another post by me on this strip. 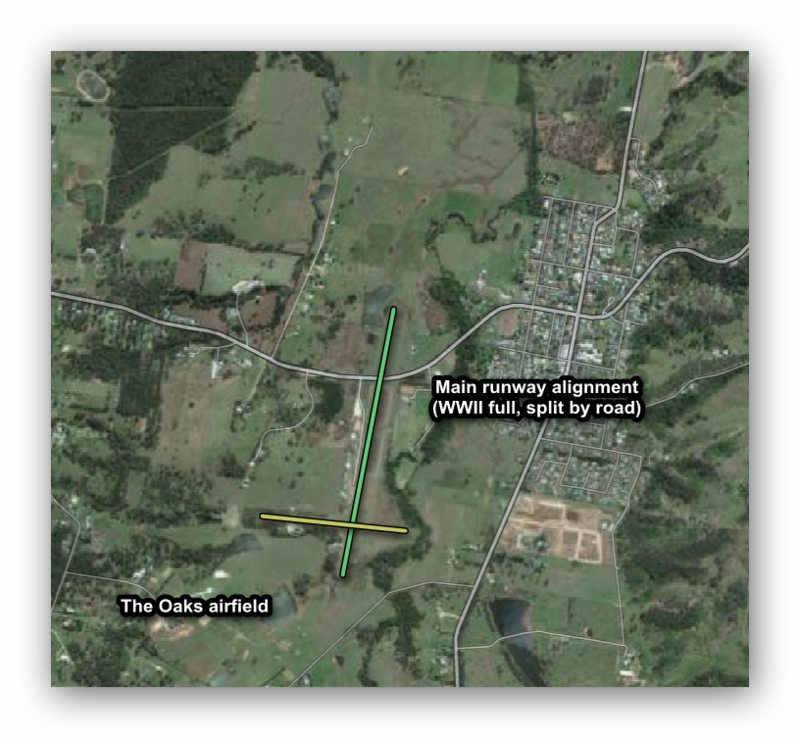 The Oaks 'dispersal' airstrip, another WWII runway, as per Menangle and several others. The image above shows what I presume to be the WWII runway alignments, as shown on a recent Google Map. The green alignment is "certain" based on what is visible and recorded elsewhere, however the shorter yellow alignment is probably only a recent development post-WWII. 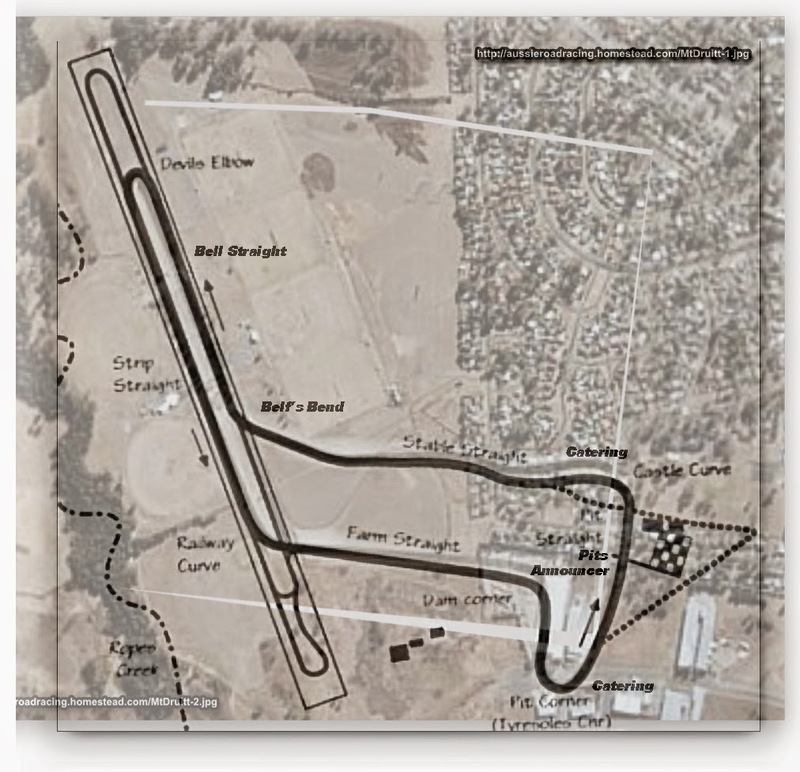 The Oaks airfield was constructed circa 1942 as a satellite aerodrome to RAAF Camden. There was a 5000 foot x 150 foot sealed runway aligned 36/18 and split by Burragorang Road (complete with gates to stop stray cars!). Operations probably included Hudsons, B24 Liberator bombers and Kittyhawks. Not required post-war by the RAAF, it was offered for sale in 1946. The current strip is a private field, roughly the southern half of the wartime area. The original runway was removed but a 950m 18/36 main grass strip (perhaps a wartime taxiway) was left and a new grass strip of just 400m added (aligned 09/27). One description states that the graded and grassed strip was 5000x 400ft and confirms the "centrally located" sealed runway measured 5000x 150ft. There were 8 fighter hideouts, similar to the hides at Hoxton Park. plus 1 included most of that plus netting and garnished camouflage. The taxiways were all 30ft wide, 2 of which were gravelled, 2 wire meshed. There were also 5 hardstanding gravelled areas and 3 hardstanding gravelled areas with wire mesh. Wikipedia has a detailed and fairly well kept description of history and current operations. Worth noting that Badgery's Creek has been selected to be Sydney's 2nd "major" airport site, if you discount Bankstown, rather than the Wilton option. Hoxton Park aerodrome - WWII dispersal strip with aircraft "hides"
Hoxton Park airstrip, Cowpastures Road, 1098m long, oriented 16/34. Closed, redeveloped. A WWII 'dispersal strip' runway (in case of Japanese attack) Hoxton closed circa 2008. It did retain features from the war, including gravelled aircraft hide-outs and wartime drainage, taxiways and markings. At the northern end of the runway could be seen 2 earlier forms of surface, one bitumen and the other gravel, and wartime drainage works were found under the runway. 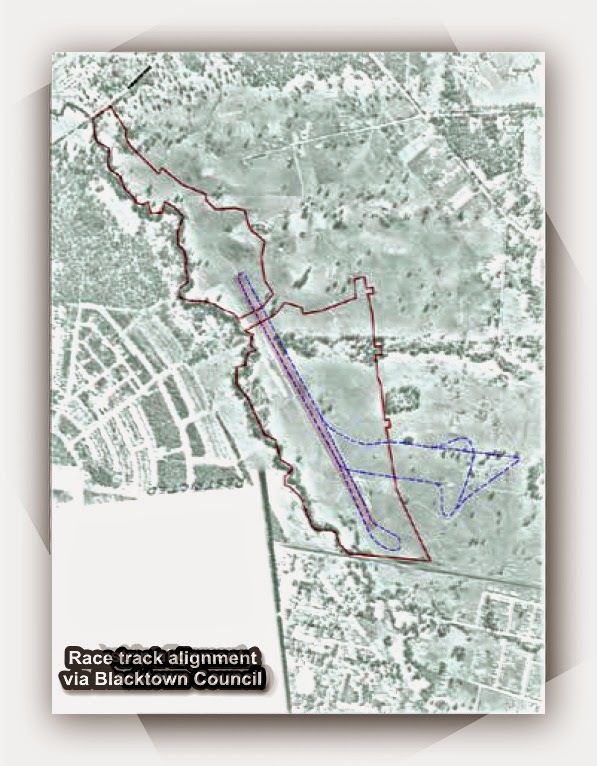 There was also a wartime taxiway leading off to the north-west, beyond what was the airport perimeter and evidence of aircraft 'hideouts' in the neighbouring eucalyptus forest. There were 2 surviving taxiway bridges across gullies or drainage lines prior to redevelopment. There was further evidence of taxiways and hideouts to the east of the current runway. The original airstrip was 5000ft (1524m) long and 172ft (52m) wide. The runway had been shortened since World War II and the former runway extension is noticeable at the northern end of the runway. 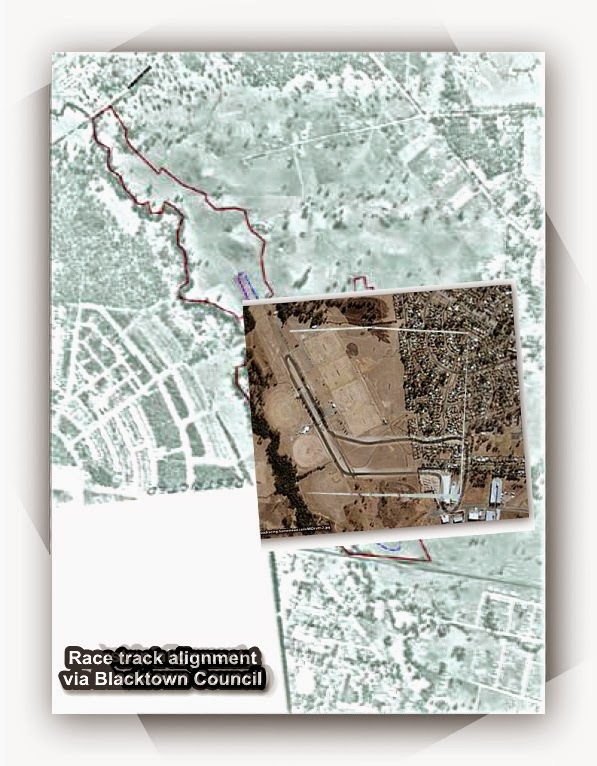 The aircraft revetments or hideaways to the west of the aerodrome may have been removed or destroyed during the construction of the M7 motorway and building of a large suupermarket distribution centre. Progress? As a personal note I used to practise "touch and goes" at Hoxton, circa 1974 to 1977. I never actually progressed to a full licence - I got distracted by cars and cameras and ran out of cash! - but it was an excellent site for flying training, close to Bankstown airport but not too close, plenty of emergency landing options and quiet. I also parachuted from Hoxton in or around 1979. 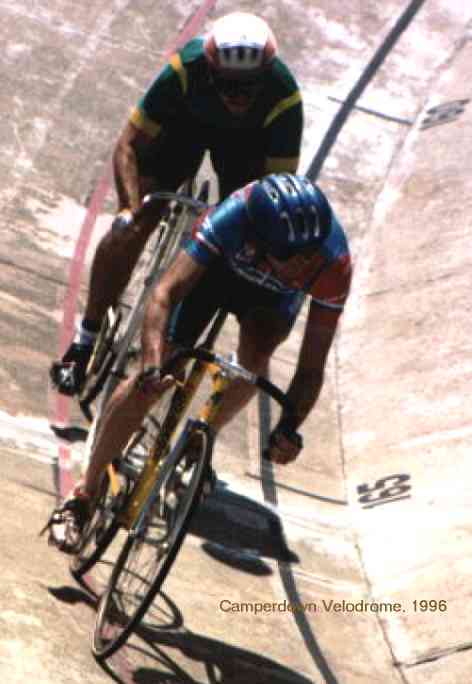 I've raced both cars and bicycles and part of the interest - if not the actual thrill - is, for me at least, the race tracks or circuits themselves. Maybe it's the design, or the history, or the cultural associations; I don't know. Maybe humans just have an affinity with tracks. Perhaps it's all of that. I even like old horse/pony tracks yet I've never been to "the races". Anyway, I'm not that into oval speedway racing but I do like the famous old race tracks. 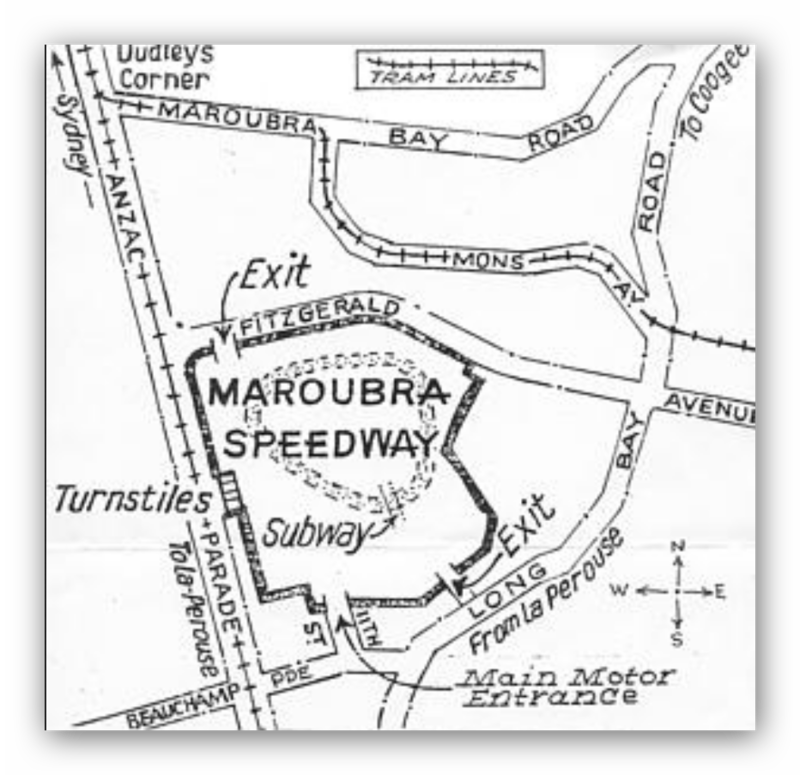 And Sydney's Maroubra "Olympia" Speedway is a fine example of a banked concrete bowl or oval, modelled as it were along the lines of an overgrown bicycle velodrome. Which is pretty much exactly what it is, or was. If you race pushbikes at Heffron Park (as I used to do) you'll know the area - it's just a hop, skip and a wheelie across Anzac Parade. And in the 1920s that equated to a long way out of town. When competition reopened at the much more convenient Sydney Showground patronage at Maroubra fell sharply. Coupled with the free viewing offered from local sandhills and a possibly undeserved reputation as a "killer" track (although it was indeed the scene of several deaths) revenues failed to match costs.. and thus it closed. If you look at today's maps you'll see housing with a park in the middle. No sandhills! It's been that way for as long as I can recall. Actually there is a remnant sandhill in Heffron Park, less than a kilometre to the west, if you want to check it out. 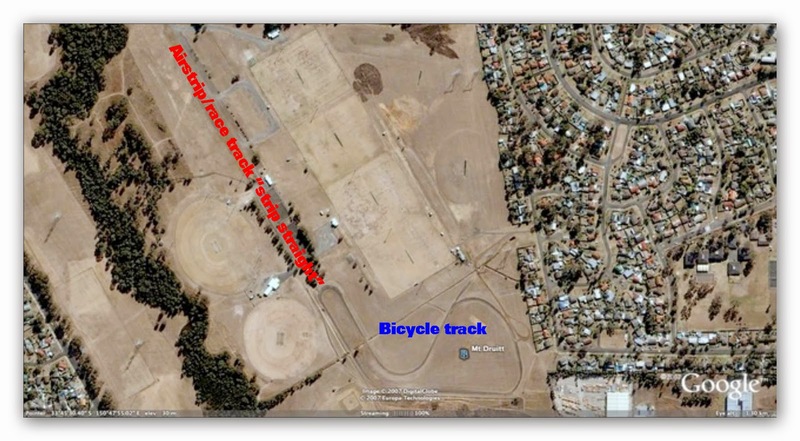 Heffron itself was a military base, then migrant housing before re-dedication as a park with public pool, cycling (criterium) circuit and other sports fields. It's likely that the original indigenous people camped there as well with some evidence of fire and middens in the area, although sadly much of that evidence has been lost.